CompX eLock 300 Series is a keyless, network ready, electronic access control lock for cabinetry, refrigerators, freezers and incubators. Audit trails of the last 15,000 access attempts track date, time and user name. Temperature monitoring is also available. CompX eLock 300 Series, available in cabinet and refrigerator versions, allows for audit trail reporting (last 15,000 access attempts) and up to 3,000 unique ID codes to be entered. It is a keyless system – there are NO keys to lose or share. The eLocks can be programmed to read a facility's existing employee identification cards using HID proximity, HID iCLASS proximity, or magnetic card credentials. The network function allows two-way (eLock and LockView 5) communication on existing network systems either by 802.11g wireless or Ethernet connection. Additionally, temperature monitoring is available with the cold storage version - with or without access control. 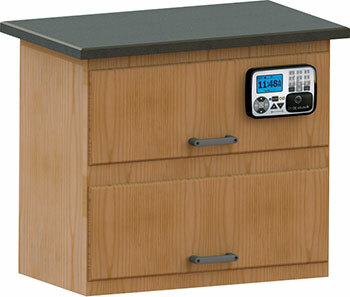 CompX eLock 300 Series is a keyless, network ready electronic access control lock for cabinetry. Since the eLock is keyless system, there are NO keys to lose or share. 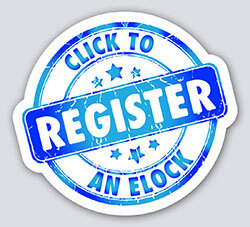 The eLock also provides a comprehensive audit trail of the last 15,000 access attempts - including date, time and user name – which can be viewed with LockView 5 software. The network function allows two-way (eLock and LockView 5) communication on existing network systems either by 802.11g wireless or Ethernet connection; proprietary access points, repeaters or other infrastructure alterations are not required. The transmission of eLock access data (audit trail) occurs wirelessly from the eLock to a facility’s wireless access point (i.e. router), where the information is then delivered to the network server. LockServ, a module of LockView 5 software, resides on the network and directs information from the server to LockView for processing. Information from LockView to the eLock will follow the reverse path, enabling two-way communication while utilizing familiar security encryption methods; WEP 64-key, WEP 128-key, WPA-PSK (TKIP), WPA2-PSK (AES) and other enterprise-class wireless security. An average data transfer of four (4) user changes and twenty-five (25) audit trail events is around 20 KB. As a means of comparison, this is equal to the size of a small email message. 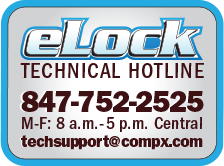 LockView 5 software enables updates via the network to any eLock on the system. Updates can include: user changes, eLock changes and access rights changes. The network cabinet eLock has the ability to alarm at the unit and at the PC on four different alerts: low battery, failure on network check-in, *unauthorized entry and *door ajar (*requires optional door switch). Alerts can be sent to designated responders and will escalate until the alert has been cleared. The Notes Entry feature in LockView 5 software provides documentation for what action was taken as the result of an alert. The cabinet version has three components: eLock controller, battery pack and latch. The eLock controller mounts directly on the outside of the cabinet door or drawer, while the battery pack (6-AA, not included) and latch are mounted inside. 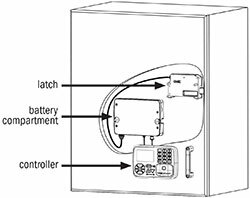 Since the batteries are located inside the cabinet, every eLock unit includes a jump start 9-volt power port, which allows the user – with a valid credential – to access the eLock when the batteries are exhausted. All eLocks have non-volatile memory, ensuring that all users, audit trails and other programmed features are not lost in the event of a power outage. 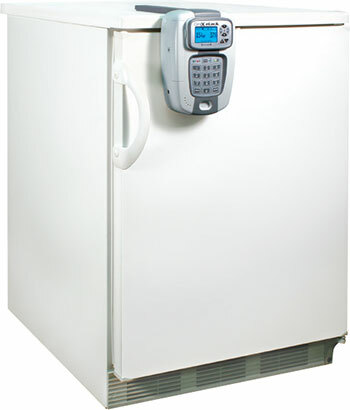 CompX eLock 300 Series is a keyless, network ready, temperature monitoring with access control lock for refrigerators / freezers. CompX eLock eliminates manual temperature logging, prevents human error and automatically records temperature at programmed intervals. All data history is archived and easily accessible. Since the eLock is keyless system, there are NO keys to lose or share. The eLock records up to 500,000 temperature data points and provides a comprehensive audit trail of the last 15,000 access attempts - including date, time and user name – which can be viewed with LockView 5 software. The eLock with standard temperature monitoring, monitors internal temperature of 100°C to -40°C; ultra-low temperature monitoring, 100°C to -100°C, is also available. The network function allows two-way (eLock and LockView 5 software) communication on existing network systems either by 802.11g wireless or Ethernet connection; proprietary access points, repeaters or other infrastructure alterations are not required. The transmission of eLock access data (audit trail) and temperature logs occurs wirelessly from the eLock to a facility’s wireless access point (i.e. router), where the information is then delivered to the network server. LockServ, a module of LockView 5 software, resides on the network and directs information from the server to LockView for processing. Information from LockView to the eLock will follow the reverse path, enabling two-way communication while utilizing familiar security encryption methods; WEP 64-key, WEP 128-key, WPA-PSK (TKIP), WPA2-PSK (AES) and other enterprise-class wireless security. An average data transfer of four (4) user changes and twenty-five (25) audit trail events is around 20 KB. As a means of comparison, this is equal to the size of a small email message. The network eLock with temperature monitoring has the ability to alarm at the unit and at the PC on five different alerts: temperature-out-of-range, low battery, failure on network check-in, *unauthorized entry and *door ajar (*requires optional door switch). Alerts can be sent by email, or Short Message Service (SMS), to designated responders and will escalate until the alert has been cleared. The Notes Entry feature in LockView 5 software provides documentation for what action was taken as the result of an alert and the Compliance Dashboard provides at-a-glance status of all eLocks on the network. Refrigerator / freezer versions have all three components – eLock unit, battery pack, and latch - enclosed in a housing which mounts directly on to the appliance door. 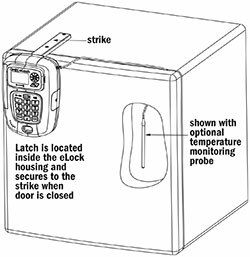 The strike plate is easily mounted on the top or side of the appliance and supplies a secure latching point for the latch. The motorized spring loaded latch provides the convenience of automatic relocking – eliminating the need for cumbersome hasps and padlocks. The eLock is powered by 6-AA batteries (9-volt wall adaptor port is available) and all eLocks have non-volatile memory ensuring that all users, temperature logs, audit trails and other programmed features are not lost due to loss of power.